Description: A former Conrail SD40-2 moves through Croxton yard with four New Jersey Transit Comet V coaches. Description: A former Conrail SD40-2 backs four New Jersey Transit Comet V coaches onto a clear track. Description: Ex- Conrail 6007, 6853 and 6479 working hard @ 0920 hrs. Description: A late NS 143 make a daytime appearence near MP 81 on the Marion branch. Title: Ex Conrail sd40-2 soaking up the sun. Description: 326 has been the train to see for Blue power lately, and today is no different. Description: NS 344 blares over the Portage River on it's trek east towards Bellevue. Description: Southbound at Race St., with two BNSF engines on train. 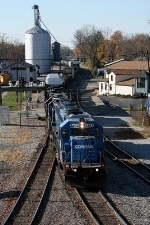 Description: A D9W/M2 combo are coupled with a blue ex-CR SD40-2. Description: Under the lights and leading the H68 back to Reading..